Style: Grande Taster 8420 19 oz. Monogram: Font Style: Please Choose OneNoneMono #1Mono #2Mono #3Mono #4DMono #5Mono #6Mono #8 Who is this item for? 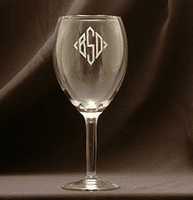 This larger classic wine glass will please even our most discriminating friends. The glass stands 8 1/2" tall and has a 19 1/2 ounce capacity. Measurements and capacities are approximate.